Studies are underway in more than 50 locations in the country in search of sources of electricity generation. The spots include Lake Natron which is believed to have potential in geothermal. The Permanent Secretary in the Ministry of Energy and Minerals, Mr Eliakim Maswi, told the 'Daily News' that the government is working in collaboration with Japan International Cooperation Agency (JICA) in the Lake Natron study. "We have come to learn that on the other side of the lake, in Kenya, they have power plants. They generate nearly 300MWs. Therefore it is crucial that we initiate a thorough study on our side," he said. Mr Maswi said that the government was interested in geothermal due to its reliability and sustainability in power generation. "Lake Natron potential in geothermal emanates from the fact that it lies in the Rift Valley but at the moment we have nothing tangible yet. It is just a mere study," Mr Maswi said. Mt. Princeton Geothermal LLC officials Fred Henderson III, chief scientist, and John “Hank” Held, CEO, presented their plan to bring geothermal energy to Chaffee County Friday, at Mount Princeton Hot Springs Resort. They have obtained exploratory leases to 3,700 acres of state-owned land near Mount Princeton with the goal of locating geothermal water at temperatures between 275 and 325 degrees, which could be used to generate electricity. Turkish conglomerate Zorlu Group inaugurated an 80 MWe geothermal power plant in the Aegean province of Denizli in a ceremony yesterday. Zorlu Energy won the tender for operation rights of the Kızıldere Geothermal Power Plant in 2008 and raised its capacity from 6 MWe to 15 MWe, he said. “Kızıldere 2 will raise the capacity to 95 MWe and will take its place among the world’s largest geothermal fields,” Zorlu adding. The new plant is Turkey’s largest geothermal power plant, he said. U.S. Geothermal Inc., announced today that its wholly owned subsidiary, USG Nevada LLC, has entered into a long term project loan agreement with Prudential Capital Group and related entities, for the Phase I San Emidio geothermal project in northwest Nevada. The loan is for $30.74 million, has a term of just under 25 years, and bears a fixed interest rate of 6.75% per annum. Proceeds from the loan will be used to repay the construction loan, fund project reserves, and pay certain closing expenses. In addition, $2.56 million will be distributed to U.S. Geothermal Inc. and be available for general corporate working capital purposes, including the further development of Phase II at San Emidio. 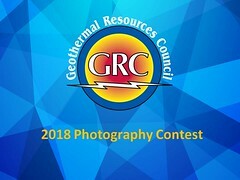 The Geothermal Resources Council (GRC), a non-profit educational association dedicated to the promotion of geothermal energy and associated technologies around the world, is pleased to announce the recipients of two (2) $USD 2,500 GRC Scholarship Awards. The award of the first GRC Scholarships to two international students reflects the diverse world-wide membership of the Geothermal Resources Council. Andrés’ enthusiasm for geothermal was sparked early in his life. “This passion started when I was a young boy, spending summers on our family farm on the Casita Volcano near Chinandega, Nicaragua. I vividly remember cooking eggs in the fumaroles with my mom and playing with my cousins by tossing hot mud at each other”. Andrés holds three citizenships (Nicaraguan, American, and Peruvian) and looks to geothermal energy as a solution to many social and economic problems in Latin America. He obtained a B.Sc. in Geology, with emphasis in geothermal, and a Bachelor of Business Administration in Finance, with a emphasis on energy finance, from the Southern Methodist University in Dallas, Texas, which included experience in the SMU Geothermal Laboratory. Andrés has promoted geothermal energy development in Peru through research, talks, videos and blogs, gaining the attention of a number of international groups and media sources, including the American Association of Petroleum Geologists, and National Geographic. He has helped produce a documentary The Boiling River, funded in part through the National Geographic Young Explorers Grant Program, on exploring a mythical river sourced by hot geothermal waters, while working with the indigenous Ashaninka community who guards it. The movie will receive its world premiere at the GRC Annual Meeting in Las Vegas. Koenraad is originally from Belgium. He obtained a Bachelor’s and Master’s Degree in Mechanical Engineering at the University of Leuven in Flanders, and conducted research for his Master’s thesis at the Technical University of Munich in Germany. Through a Fulbright fellowship, Koenraad enrolled in a Master’s of Engineering program in Energy Economics and Engineering at Cornell University focusing on studying geothermal reservoir simulations for the renewability of Enhanced Geothermal Systems. Koenraad is passionate for the industry. “Geothermal energy fascinated me because the many advantages are clear and the resource is enormous, but it is widely misunderstood and overseen by the general public”. The scholarships were presented today at the Opening Session of the GRC Annual Meeting, being held at the MGM Grand in Las Vegas, Nevada, USA. 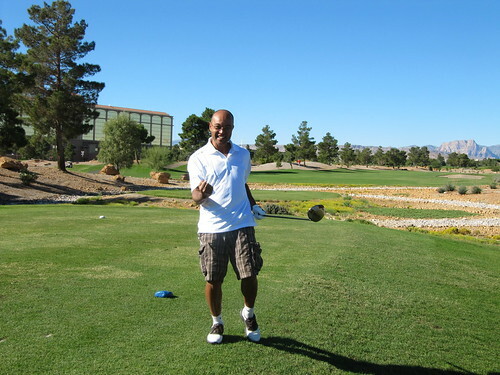 The GRC Annual Charity Golf Tournament was held earlier today in Las Vegas. 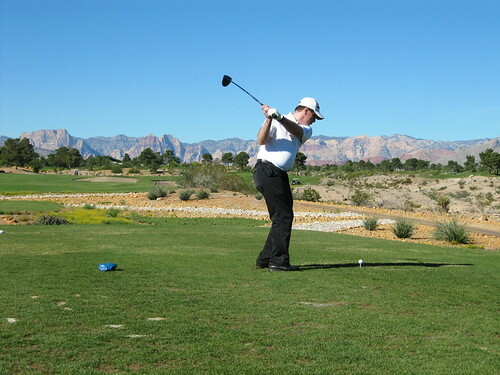 The spectacle was held at the Angel Park Golf Club - Mountain Course with the proceeds this year going to the local chapter of the Make-a-Wish Foundation. The GRC Annual Meeting & GEA Geothermal Energy Expo continues this evening with an Opening Reception and then the GRC Annual Meeting Opening Session is tomorrow at 8:30 am. 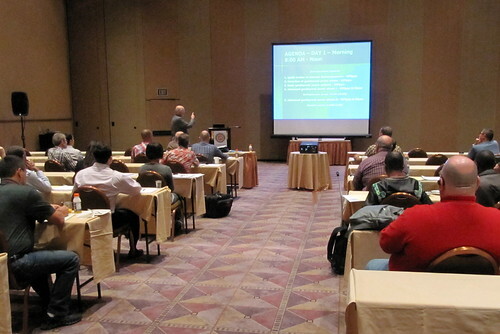 Over 100 attended the GRC Workshops at the MGM Grand over the last two days. The group from the Geothermal Exploration in the 21st Century workshop led by Jeff Witter from Mira Geoscience Ltd., provided participants with a multi-faceted overview of modern exploration methods applicable to the discovery of geothermal resources. All the attendees thought the presentations were very informative and useful in gaining knowledge about the latest geothermal developments. 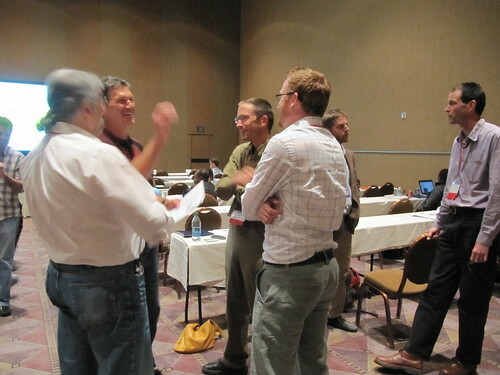 The workshops are a great way to meet colleagues in the geothermal energy community and make lasting friendships. The GRC Annual Meeting & GEA Geothermal Energy Expo continues opens today with an Opening Reception. 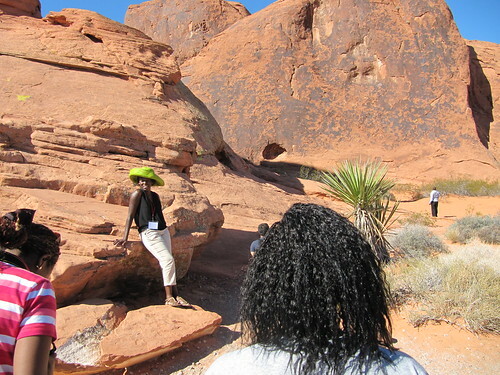 A GRC Field Trip set off yesterday into the desert around Las Vegas to view some of the natural wonders of the area. 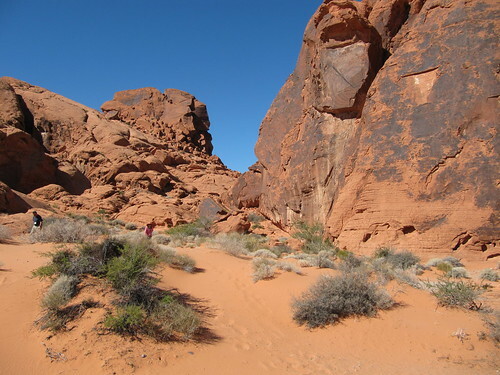 The Las Vegas Valley Geology Field Trip stopped at the Valley of Fire State Park, Muddy Mountain and the Great Unconformity at Frenchman Mountain. 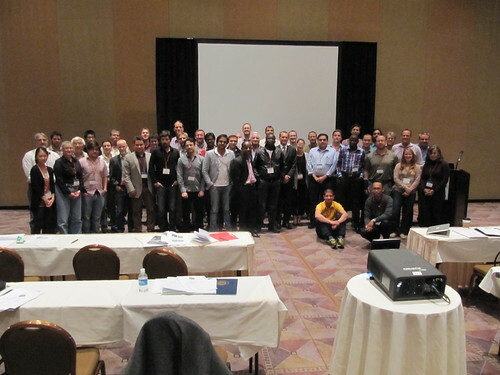 The GRC Field Trip is a prelude to the GRC Annual Meeting & GEA Expo starting today at the MGM Grand in Las Vegas. 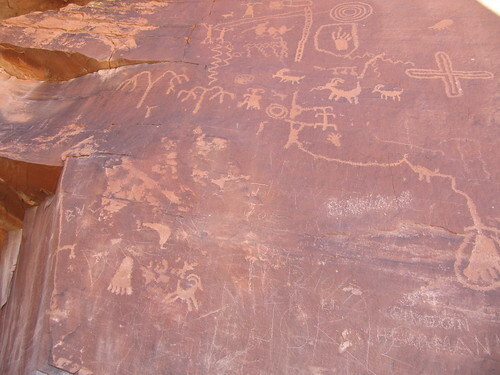 At one stop the group were excited to see some petroglyphs from an archaic native American community. The red rocks of the valley were the main attraction for most but some fashion conscious day-trippers had other ideas! Reykjavik Geothermal, the Icelandic company that’s helped build power plants in more than 30 countries, agreed to develop as much as 1,000 megawatts of projects in Ethiopia over the next 10 years. The company expects to spend a total of $4 billion and will begin drilling test wells early next year, Chairman Michael Philipp said in an interview today in New York. About 10 megawatts will be in operation by 2015, with a total of 500 megawatts by 2018. A second phase may include as much as 500 additional megawatts of capacity. Ethiopian Electric Power Corp. has agreed to buy all the electricity under a 25-year contract. The African Development Bank (AfDB) is highlighting geothermal power as a way of not only helping to meet the energy demands of countries in the Horn of Africa and the Rift Valley, but also as part of a 'green growth' agenda in its 2013-2022 strategy for African transformation. In total, the Rift Valley could produce up to 14,000 MWe of geothermal power, a type of clean, renewable energy whose exploitation the bank is financing. The Geothermal Resources Council (GRC) Annual Meeting kicks off this weekend at the MGM Grand Conference Center in Las Vegas, Nevada, USA. As a prelude, the GRC is holding two workshops on the latest in geothermal energy developments. New Developments in Power Plants led by Ronald DiPippo, Professor Emeritus, University of Massachusetts Dartmouth is an overview of the basic energy conversion systems appropriate for various geothermal resources. Geothermal Exploration in the 21st Century led by Jeff Witter from Mira Geoscience Ltd., provides participants with a multi-faceted overview of modern exploration methods applicable to the discovery of geothermal resources. The GRC Annual Meeting & GEA Geothermal Energy Expo continues with an Opening Reception on Sunday, September 29. ARANZ Geo Limited has won the NZ Best Business Operating Internationally - Under $10m category at the 2013 New Zealand International Business Awards. The Christchurch-headquartered company also received the first Special Commendation in the history of the awards, after narrowly missing out on the Supreme Award, in recognition of their world leading technology and impressive revenue and market growth over the past three years. ARANZ Geo’s pioneering Leapfrog 3D geological modelling software is used by the world’s mining, geothermal and hydrogeology industries. The company exports 99.8% of its software to virtually every part of the globe. With implementation of a comprehensive Salton Sea restoration plan years away at best, if at all, the Salton Sea Authority is developing a method to evaluate smaller projects that help rehabilitate the sea incrementally as small amounts of funding become available. The Imperial Irrigation District is advocating the development of the Salton Sea’s geothermal resources for additional green energy while securing long-term funding for environmental restoration. “In our minds, geothermal and other renewable energy … in the southeast corner (of the Salton Sea) is going to be very important, and we need to work to put that into the plan,” Wilcox said. “From a geothermal point of view you have to go where the resource is, so that’s the southeast corner (of the Salton Sea). From a perspective of habitat, you have to go where the water is. So that means the south end or the north end primarily,” he said. The idea of building habitat next to geothermal energy plants is not as unusual as it might first appear, Wilcox said. Most of the area’s geothermal plants are near the Sonny Bono Salton Sea National Wildlife Refuge on the southern end of the Salton Sea. A GRC Field Trip will visit some of the geothermal power plants around the Salton Sea on Thursday, October 3, as part of the GRC Annual Meeting & GEA Expobeing held at the MGM Grand in Las Vegas, Nevada, USA. Analyst Alexander Richter looks at the project pipeline for global geothermal projects. In its research, ThinkGeoEnergy has counted 806 geothermal power projects in development with a combined capacity of 23,313 MW, with the majority in Asia, North America and Africa. That sounds impressive, but the industry faces strong challenges everywhere. Projects need to secure government approval, public consent (sometimes complicated by local opposition), power purchase agreements and, last but not least, necessary financing. The latter has been particularly challenging. 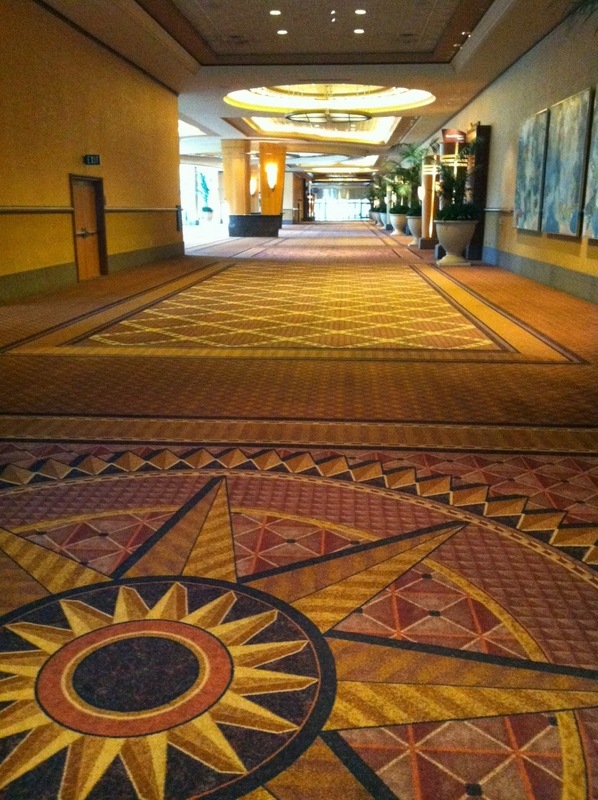 The GRC staff have arrived at the MGM Grand Conference Center in Las Vegas. We are getting everything ready for the Geothermal Event of the Year. Follow Global Geothermal News for the very latest updates. We will be "Live Blogging" from all the many events of the GRC Annual Meeting and the GEA Trade Show. 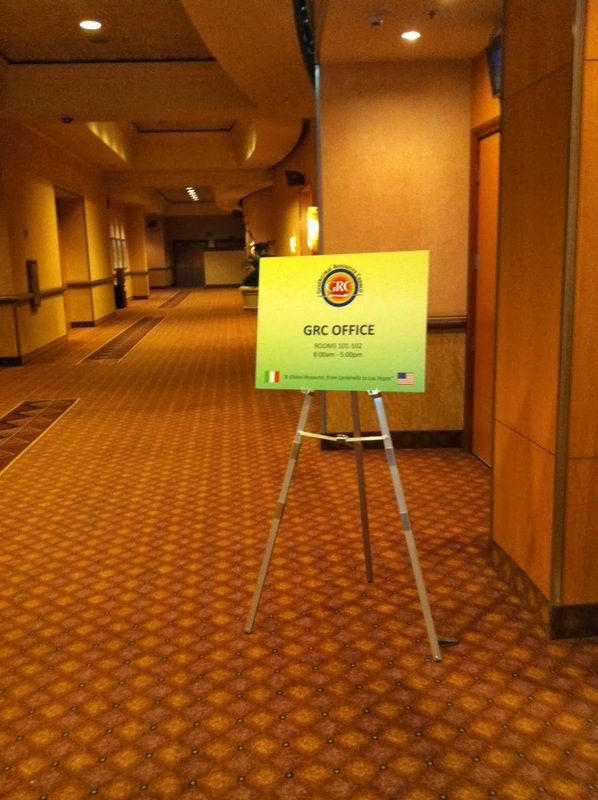 The GRC Annual Meeting is being held in the MGM Grand Conference Center. It is a warm and inviting space with wide open rooms and corridors. It is relatively quiet compared to the hustle and bustle of the rest of the resort. The Victoria state government is conducting a statewide review on geothermal energy and will consider whether or not it will scrap a licence for a $30 million geothermal project in Koroit. Victoria’s fledgling geothermal industry has failed to deliver projects, prompting a statewide review due to be handed down in a fortnight. The company behind the Koroit project, Hot Rock Limited (HRL), has axed three of its five projects but has left its south-west plans on the books. Geothermal companies have been sitting on five-year exploratory licences around Victoria waiting for investors. When the permits expired last year the government extended them by another 12 months while it decided what to do with the troubled sector. What can National Geothermal Data System (NGDS) do for you? Save time researching! NGDS provides free access to geothermal information from all 50 states with continuous feeds of new data. Join the NGDS development team during this hands-on workshop. Please accept our personal invitation to attend the National Geothermal Data System (NGDS) Workshop, during the Geothermal Resources Council Annual Meeting and Geothermal Energy Association Annual Expo next week. 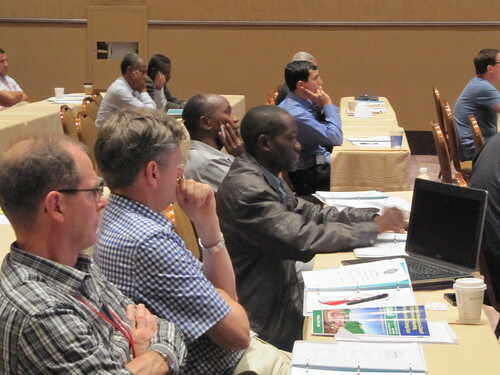 This informative workshop –"Drilling Down: How Legacy and New Research Data Can Advance Geothermal Development" (PDF)—will be hosted in Las Vegas, Nevada on October 2, 2013 in the Grand Ballroom – Room 118, MGM Grand Hotel 2pm-5pm. The National Geothermal Data System (NGDS) – a free, online, digital data network – is on track to launch in 2014, aggregating national geothermal-relevant data from across the geosciences. Information from all the Energy Department's RD&D projects and all 50 state geological surveys states is represented to serve the geothermal community and ultimately lower the cost and risk of power plant development. With numerous ways to discover, access, map, and manipulate the data via online tools and the software of choice, stakeholders can channel research efforts more effectively. Stop by Booth 336 at the GEA Expo for a LIVE DEMO and to test the NGDS User Interface! In preparation for a 2014 launch, developers need your input to make data easily accessible. Hours: Monday, 9/30 - Noon to 5 pm; Tuesday, 10/1 - 9 am to 6 pm; Wednesday, 10/2 - 9 am - noon. Your presence is vital to the conversation. Reserve your space today in this free session by completing the Google Form. Two planetary researches, one from Hampton University and the National Institute of Aerospace, the other from Louisiana State University, have published a paper in the journal Nature suggesting that for a period of time, the Earth was very similar to Jupiter's moon Io—with heat from within being released through what are known as heat-pipes. The new theory by William Moore and Alexander Webb goes against the common consensus that the Earth transitioned directly from a planet with a hot molten liquid layer to one covered by tectonic plates. Fitch Ratings has affirmed the rating on Coso Geothermal Power Holdings LLC's (CGP) $629 million ($486 million outstanding) pass through certificates due 2026 at 'CC'. The ratings affirmation reflects the continued expectation that default is probable, as operating cash flows and reserve funds will be insufficient to meet long-term financial obligations. CGP is a special-purpose company formed to lease and operate the Coso project, which consists of three interlinked geothermal power plants located in Inyo County, CA. Coso provides royalty payments to the U.S. Navy and the Bureau of Land Management for use of the geothermal resource. Under a series of power purchase agreements, Coso's entire output will be sold to SCE through January 2030. Cash flows from both Coso and Beowawe, an affiliated geothermal project in Nevada, are available to service CGP's rent payments under the CGP lease. Rent payments are the sole source of cash available to pay debt service on the pass-through trust certificates. The CEO of Kalahari GeoEnergy Peter Vivian-Neal says the group plans to produce power from steam resources in Zambia to help end a shortfall of electricity in that country. It is estimated that the basin where Kalahari is drilling its first exploration well may have enough resources for as much as 1,000 MW according to Vivian-Neal. “We are looking at the sedimentary basin, which in the US context might have the capacity of 100 to 1,000 MW.” Kalahari drilled its first well in Zambia’s southern province during August 2013 and the interpretation of the results should be complete by end of the year. As Southern California Edison scrambles to replace the 2,200 MWe of critical power it lost with the closure of the San Onofre nuclear power plant, the utility appears to be cutting another source from its energy mix — geothermal power from the Salton Sea. Edison’s existing contracts for 286 MWe of geothermal power from eight plants at the state’s largest lake are set to expire over a 10-year period between 2016 and 2026, said officials at CalEnergy Operating Corp., the company that owns the plants. The expiration of the Edison contracts come at a pivotal time for geothermal development at the Salton Sea. The CalEnergy plants represent the first generation of power plants running on steam from the superheated brine pulled up from under the sea and the surrounding area — a resource that some geothermal advocates say could replace most of the power lost from San Onofre. A GRC Field Trip will visit some of the geothermal power plants around the Salton Sea on Thursday, October 3, as part of the GRC Annual Meeting & GEA Expo being held at the MGM Grand in Las Vegas, Nevada, USA. Ormat Technologies, Inc.'s wholly owned subsidiary entered a Joint Development Agreement (JDA) with eBay Inc. for the development of a 5 MW Recovered Energy Generation (REG) power plant to be constructed in Utah. The JDA allows Ormat and eBay Inc. to advance negotiations on a 20-year term contract and begin preliminary development work to supply cleaner electricity to eBay Inc.'s new Salt Lake City-based data center. A GRC Field Trip will visit the Ormat developed Goodsprings Recovered Energy Generation Power Plant on Sunday, September 29, as part of the GRC Annual Meeting & GEA Expo being held at the MGM Grand in Las Vegas, Nevada, USA. The 34th Amateur Photo Contest winners will be on display at the GRC Annual Meeting in Las Vegas, Nevada. 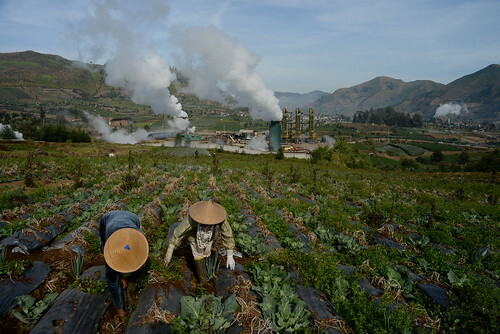 2nd Place: Environmentally Friendly, by Raditya Mahendra Yasa, Central Java, Indonesia. All the entries can be seen on the GRC Flicker website. by Philippe Dumas, Secretary General, and Luca Angelino, Policy and Project Officer, at the European Geothermal Energy Council (EGEC). The possibility of producing shale gas in some European countries has triggered a very heated debate about the environmental and social impacts of the technique used to extract gas from shale rocks (today only in the US and Canada); this technique is widely known as hydraulic fracturing or fracking. Recently, part of the gas industry has claimed that fracking for shale gas is comparable to the hydraulic stimulation process used for geothermal exploration and that the granting of geothermal exploration permits whilst those for shale gas are rejected is creating a double standard. Whilst there are similarities, it is important to understand the intricacies and differences between the two technologies. The Casita volcano could be one of the new clean energy sources in Nicaragua with 35 MW, considering that all the development tests come back positive. Currently the plan is in the exploratory stage and although it is not certain that enough heat can be obtained for electricity generation purposes, the Deputy Minister of Energy and Mines, Lorena Lanzas, said it “is evaluating the use of the volcano to enter the production phase”. The exploration phase involves the drilling of a well, which will determine the existence of vapor in sufficient quantities to generate 35 MW of energy, but as Lanzas mentioned, the potential is even greater. There is much that connects the Maori and the Hawaiian peoples. We have each dealt with histories of colonization and assimilation. We have each proven resilient in the face of adversity, striving to improve for current and future generations. In New Zealand those great strides forward are seen in the way that some Maori trusts and corporations today control and shape their own destiny with regard to geothermal resources. In part, this is thanks to the native-to-native model for development that we now use. It was introduced to us by Innovations Development Group (IDG) and Indigenous Consultants of Hawaii who have served us in an advisory capacity for several years. Pakistan can overcome the energy crisis by developing renewable energy resources especially geothermal power, readily available in most parts of the country, said Chairman Energy Foundation Pakistan (EFP) Javed Ahmad. He said that he can attract all the investment required to initiate geothermal energy power projects for 10,000 MW and start producing electricity at less than Rs 10 per unit within three years in all the provinces. He said that two geothermal based power plants in Peshawar and Lahore, have been installed and they are performing well. The 2013 Deep Geothermal Symposium is aimed at raising further awareness of the potential in the UK for this huge clean energy resource and its use as a renewable source of heat and electricity. We are delighted to have Sir Tim Smit of The Eden Project speaking, as well as contributions throughout the afternoon from speakers in the public, private and not-for-profit sectors. The event will showcase what is going on in the UK, review the latest developments in Europe and East Africa and answer the questions that need to be asked about how to make the most of this British technology and energy source. The fee for attending the afternoon is £75.00 (incl. VAT). To register, please download the application form here - or send an email to assistant@egs-energy.com. An unstable climate for investment in the renewable energy sector is not affecting the commitment of an energy company to a local geothermal resource project in Anglesea. Greenearth Energy’s Geelong Geothermal Power Project (GGPP) hit a snag last month when its expression of interest (EoI) submission to the Australian Renewable Energy Agency (ARENA) was rejected. The rejection could affect a $25 million state government commitment made through the Energy Technology Innovation Strategy, a state government funding channel for large scale, pre-commercial, sustainable energy demonstrations. Greenearth Energy is hopeful of securing more time to pursue the resource. 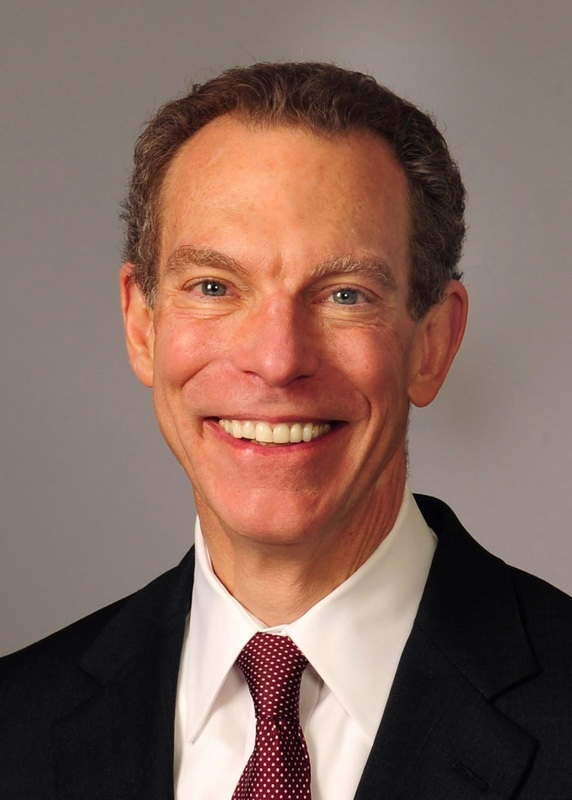 Michael W. Yackira, President and Chief Executive Officer, NV Energy, will be a keynote speaker at the Opening Session of the Geothermal Resources Council (GRC) Annual Meeting in Las Vegas on September 30. Other speakers at the Opening Session include: Gregg Rotenberg, Vice President Chevron Renewable Energy Investment; Paolo Romagnoli, Manager Geothermal Center of Excellence, ENEL Green Power; Dennis Gilles, CEO, US Geothermal, Inc.; Pierre Audinet, World Bank; Doug Hollett, Program Manager, U.S. DOE Geothermal Technology; Steve Berberich, President & Chief Executive Officer, CA ISO, Gary Johnson, Nevada Deputy State Director for Minerals, Bureau of Land Management; Rebecca Wagner, Commissioner, Nevada Public Utilities Commission. Hawaii Big Island Mayor Billy Kenoi says he intends to implement the recommendations contained in the Geothermal Public Health Assessment, including a comprehensive health effects study for Puna. Such a study on the impacts of geothermal development has been lacking the group that put together the report on behalf of Hawaii County concluded, with insufficient monitoring also complicating efforts to understand if the public’s health is at risk. 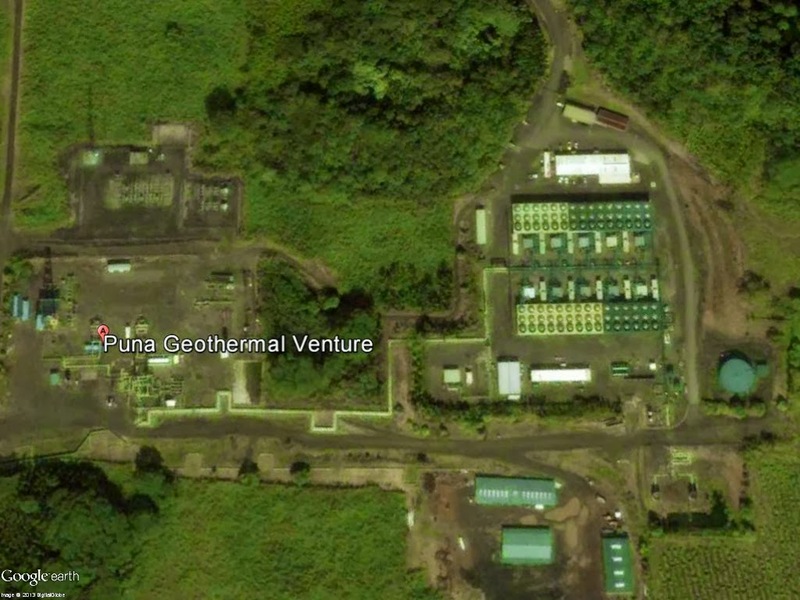 The group consisted of a dozen residents of Puna, home to the state’s only geothermal power plant, Puna Geothermal Venture, and was coordinated by Peter Adler of Accord Consultants. Its report was finalized Sept. 9 and can be viewed at www.accord3.com/pg68.cfm. Singaporean company Emerging Markets Energy Pte Ltd will make feasibility study on establishing geothermal power plants in Myanmar, according to official sources on Sunday. The feasibility study, to be carried out in Shan state, Tanintharyi, Sagaing, Magway and Mandalay regions, will be made under a memorandum of understanding reached with the Myanmar Ministry of Electric Power. The downstream of Chindwin River in Sagaing and Magway regions, Mount Popa and Singu Hill in Mandalay region and hot springs near Maungmakan Beach in Tanintharyi region have the best prospects for power generation through geothermal, experts said. In East Africa, the lack of electricity drives the use of deadly fuels. Lacking power for cooking, the region’s residents must use firewood or charcoal to heat food and water for safe consumption. The stakes are deceptively high: globally, air pollution from dirty-burning cookstoves kills millions of people annually—more than AIDS and malaria combined. Today, East Africa has the lowest access to electrical power of all African subregions, but new renewable energy projects may change that in the years to come. The hope is that, ultimately, local geothermal energy will fuel a sustainable base load of electricity, finally bringing light to a part of the world long left in the dark. Ethiopia's ambitious plans to become a carbon-neutral economy by 2025 have attracted headlines for the scale of the country's hydropower projects - but some experts hope that geothermal power will gradually get a look in too. Hydroelectric dams currently under construction in the country have garnered international attention, especially the 1,870 MWe Gibe III Dam and the 6,000 MWe Grand Renaissance Dam. But an often overlooked source of energy lies under the Great East Africa Rift Valley and the Afar Rift Valley, which pass through Ethiopia. Best known for their scenic lakes and for both active and dormant volcanoes, the two valleys also harbour a largely untapped potential for geothermal electricity production, in which heat stored in the earth is tapped and used to drive turbines to create power. The sixth annual International Luncheon at the GRC Annual Meeting and GEA Energy Expo, will bring together experts from around the world with U.S. private and public sector stakeholders to discuss the latest developments in harnessing East Africa’s considerable geothermal energy resources. The International Luncheon will be held on Monday, September 30 in Room 119 of the MGM Grand Conference Center, from 12 Noon - 1:30 p.m.
Andrés Ruzo is a National Geographic Young Explorer who has produced a new movie documentary that will premiere at the GRC Annual Meeting in Las Vegas. In this promotional video for the documentary, sponsored by BMW, Andrés describes his interest in geothermal energy. Meet Andrés in person along with the director Peter Koutsogeorgas when they present their documentary at the GRC Annual Meeting. BMW - Explorer Andres Ruzo [:30] from Evolve Digital Cinema | IMG on Vimeo. US President Barack Obama has unveiled a proposal to limit carbon emissions on new power plants built in the US. It would be the first federal attempt to impose limits on the pollution blamed for global warming. "Climate change - caused by carbon pollution - is one of the most significant public health threats of our time," said Environmental Protection Agency head Gina McCarthy. As of September 29th, the GRC will accept on-site registrations only. Registration fees will go up an additional fifty dollars. Don't miss out on the discount and register for the largest annual geothermal conference in the world, the GRC Annual Meeting and GEA Energy Expo. ﻿Download the Registration Form (PDF), fill it out and email, fax, or mail it to us! *Please Note: For online registrations, you will need your login id and password or you can create one if you are not in our database. If you do not know your login id or password, please feel free to contact the GRC office by phone at (530) 758-2360 ext 100 or by email at alay@geothermal.org. The Honourable Leona Aglukkaq, Minister of Environment, Minister of the Canadian Northern Economic Development Agency (CanNor), and Minister for the Arctic Council, today announced funding for research into long-term, clean energy options, in particular geothermal energy, for the Kaska Nation. "This project will assist the Kaska Nation to make informed decisions about potential geothermal resources on their lands," said Ryan Leef, Yukon Member of Parliament. "Positive results from this research could lead to new project development, which in turn could create jobs, new businesses and build capacity." "The Kaska are cautiously optimistic that geothermal resources will prove to be viable near our communities," said Derek Loots, President of the Kaska Energy Corporation, a Kaska-owned corporation. "Geothermal energy is ideally suited to our northern climate and it is in keeping with our philosophies of small footprints on the land and sustainable opportunities for our people and the region. It is the Kaska vision to play a lead role in energy development within our traditional territory." Energy Development Corp (EDC) said it will extend the maintenance shutdown of the Bacon-Manito geothermal plant after discovering hairline cracks in its turbine blades. In a disclosure to the Philippine Stock Exchange, EDC said it found hairline cracks on the turbine blades of BacMan's 55 MWe Unit 1 following scheduled maintenance works on the power plant. EDC may send Unit 1's steam turbine rotor to the Sulzer Turbo Services facility in Indonesia for repairs similar to what it did to BacMan's Unit 2, which is estimated to return to service in the second quarter of 2014. Ten companies including Idemitsu Kosan Co. and Japan Petroleum Exploration Co. will kick off a study this month on building one of Japan’s largest geothermal power plants, government officials said Friday. The plant, to be built in a national park in Fukushima Prefecture, would have an estimated capacity of 270,000 kw, or about half of all geothermal power capacity nationwide. The Ministry of Economy, Trade and Industry intends to subsidize the study, the officials said. The companies involved plan to examine an area of around 80 sq. km around Mount Bandai, a stratovolcano in Fukushima, in a year. Test drilling, environmental impact assessments and construction are expected to take 10 years. In a country where 84% of the population does not have energy access and where the geothermal potential is among the greatest in the world, the Menengai geothermal steam field development project will exploit a portion of this potential to provide power to about 500,000 households and 300,000 businesses. The project was approved in 2011 and is expected to be completed in 2016. The project is co-financed by ADF (UA 80 million), the Climate Investment Funds – hosted by the AfDB Group – (UA 16 million), the French Development Agency (UA 46 million), the European Investment Bank (UA 24 million), and the Government of Kenya (UA 158 million). The AfDB Group has led the development of the project since 2010, which included assisting the Geothermal Development Company (a corporation wholly-owned by the Government of Kenya) to build a bankable financial model for the project, and catalyzing financing from other DFIs and the Climate Investment Funds. The Bank Group’s intervention helps address the drilling risk that the private sector is hesitant to assume and lays the ground for private sector involvement in power generation. Geothermal energy isn’t a new concept. The first geothermal plant was built in 1904 in Larderello, Italy; it is a “steam field” that continues to produce energy today. Generations have tapped into geothermal energy on a smaller scale. Spend some time in Japan and you’ll see how Japanese have incorporated hot springs, a byproduct of geothermal heat, into their culture. Many cultures around the world have been using hot springs for cooking and medicinal purposes for thousands of years. But today, geothermal heat is big business because it can help reduce dependency on fossil fuels, while providing a reliable and long-lasting energy source. Out in the burnt orange tinged dirt, under a fierce sun, next to a dry river bed, Geoff Ward wears a wide-brimmed hat to protect his bald pate from the extreme conditions in Australia’s Channel County – a harsh, arid area once known for cattle grazing. Behind him are a couple flat roof structures with a series of pipes threading in and out of them. Here, in nearly the geographic center of a continent, but really in the middle of nowhere, Ward and his team at Geodynamics embraced the dust and sweat to find an untapped fuel source that just may change the way countries around the globe think about energy sustainability. There will be 16 presentations on EGS as part of the GRC Annual Meeting Technical Sessions being held September 29 - October 2 at the MGM Grand in Las Vegas, Nevada, USA. between the inner and outer linings. When new tunnel structures are constructed in inner cities, this provides an excellent opportunity to also tap geothermal energy parallel to this and with little expenditure and effort. This energy can be used, for example, for heating and cooling buildings. 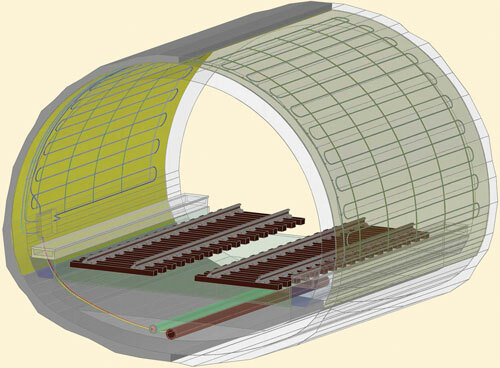 The BINE Projektinfo “Air-conditioning with geothermal energy from underground metro tunnels” (09/2013) presents a research project in Stuttgart. The aim is to research the effects of extracting heat from the surrounding ground. 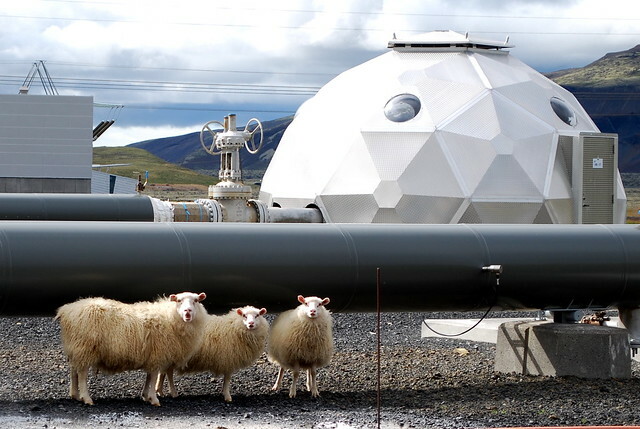 1st Place: Geothermal Sheep, by Hildur lngvarsdottir, Reykjavik, Iceland. 3rd Place (Tie): Flow Test of Tol-4 Well at Tolhuaca Geothermal Prospect, by Silke Lohmar, Santiago, Chile. 3rd Place (Tie): McGuiness (Little Power Plant in the Prairie), by Haim Shoshan, Yavne, Israel. Honorable Mention: Behind the Cotton Grass Fields, by Hildur lngvarsdottir, Reykjavik, Iceland. Honorable Mention: One Night in Kamojang, by Sangap Yohanes Berutu, Jawa Barat, Indonesia. Geothermal energy drilling is a noisy, smelly 24-hour operation, said Sandra Eru, legal adviser to a New Zealand trust that operates a 10 MWe geothermal plant in New Zealand. The Maori Trust attorney spoke to about 40 people Tuesday night at a private gathering at Wainaku Center in Hilo, sponsored by Huena Power, part of Innovations Development Group, a native Hawaiian renewable-energy development firm founded in 1998 by Roberta Cabral. 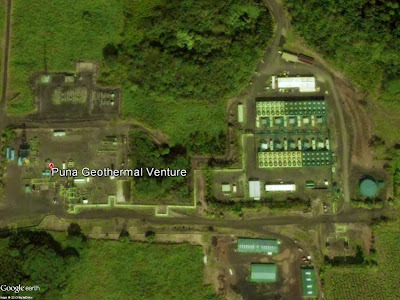 Huena is one of several energy development firms that have submitted bids for a contract with HELCO to develop a 50 MWe geothermal project on the Big Island. The winning bid on the estimated $200 million project is expected to be announced before the end of September. The Geothermal Resources Council (GRC), the world’s premier geothermal association, has announced awards honoring the best and brightest of the global geothermal energy community. These prestigious awards have been a highlight of the geothermal calendar since the late 1970's. The GRC will present its prestigious Aidlin, Henry J Ramey Jr., Ben Holt, Pioneer, and Special Achievement awards at its Annual Membership Meeting & Awards Luncheon, the climax to the GRC Annual Meeting, at the MGM Grand in Las Vegas on Wednesday, October 2. For lifetime achievement in the advancement of geothermal energy worldwide and for steadfast support of the Geothermal Resource Council. For pioneering and continuous contributions to the development of Central America's geothermal resources. For lifetime achievements in geothermal reservoir engineering worldwide. For significant contribution to engineering works on geothermal power plant design. For effective and steadfast efforts to educate, train and mentor new generations of geothermal experts. For outstanding contributions to the understanding and development of Engineered Geothermal Systems. For acknowledgement of accomplishments at Chena Hot Springs and of steadfast support advancing interest in and development of geothermal resources. For outstanding contributions in improving the use of geophysical methods and conceptual models in the evaluation and development of geothermal resources. Come see and congratulate your fellow colleagues at the GRC Annual Membership Meeting & Awards Luncheon. You can purchase your ticket with your Annual Meeting registration form or by contacting Anh Lay at alay@geothermal.org. The audience at Sierra Nevada Forums’ latest event, “Fueling Change: An Emerging Renewable Energy Era,” in Carson City on Tuesday, heard talk of the state being at 18 percent in its drive toward a 25 percent Renewable Portfolio Standard by 2025. Alan Gerstler, Desert Research Institute (DRI) vice president and director of DRI’s Clean Technologies and Renewable Energy Center, said geothermal is competitive and has numerous pluses, while solar and wind are intermittent energy sources. He showed a slide saying renewables are “closing in on cost parity” with fossil fuels. He also made the point that environmental, health care and other cost factors aren't always included in comparative assessments. Jack McGinley, NV Energy director of regulatory and legislative strategy, pointed out data showing the cost differential despite renewables coming down from prior years. He also said NV Energy likes geothermal, praising reliability because it is a “baseline resource.” Wind, he said, is more of a challenge to harvest in Nevada than solar. Paul Thomsen, Ormat’s director of policy and business development and a recent Sandoval administration appointee as the director of Nevada’s Office of Energy, described his geothermal energy company’s contribution to the state’s renewable portfolio. He cited a $1.5 billion total investment. But Thomsen said geothermal is still a small part of the energy sector, comparing it with much larger oil and gas companies and saying there is considerable growth still in front of Ormat and other firms in his field. NV Energy CEO Michael Yackira and Rebecca Wagner, Commissioner, Nevada Public Utilities Commission are speaking at the Opening Session of the GRC Annual Meeting, at the MGM Grand, Las Vegas, Sept. 30. The 12 sites on the Caribbean island originally identified as potential geothermal energy sources have been narrowed to six as the feasibility studies unfold. Geologist Krishna Vaswani and partners in the project announced in January, aim to produce electricity from heat trapped underground, for the first time in Jamaica. Construction of the 15 MWe geothermal plant has a "likely" start date of 2016, but the final timeline will be determined by the research, the geologist said. Work on the plant should start in a year and a half after the research is concluded, he indicated.